Physical activity has significant health benefits, ranging from increased cardiovascular function to improved mental health and wellness. Estimating physical health is important in gauging the potential for physical health investment in a community. Improved physical activity rates act as a preventive health measure, reducing negative outcomes such as type 2 diabetes, stroke, and obesity, and improving the overall physical health of a community. 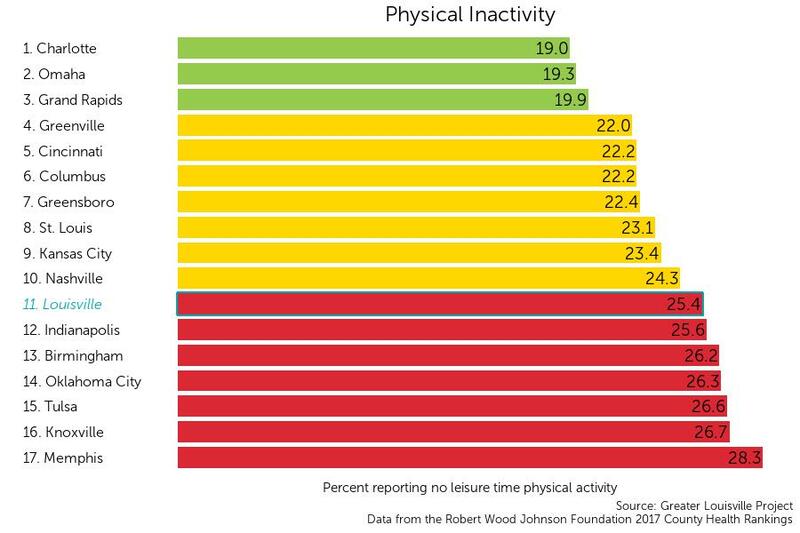 Louisville currently ranks 11th among its peer cities in percent of adults over 20 reporting no physical activity with an average percentage of 25.4. Louisville is in the bottom tier of its peer group according to a natural breaks algorithm. Cities in green are those that outperform their peers, cities in yellow represent the middle cluster, and those in red are a group that lags behind its peers on this indicator.